Do you suspect that your freezer is slacking on its one job? Then act fast before the day comes that you open the door to find melted ice cream, spoiled meats, and puddles of water. 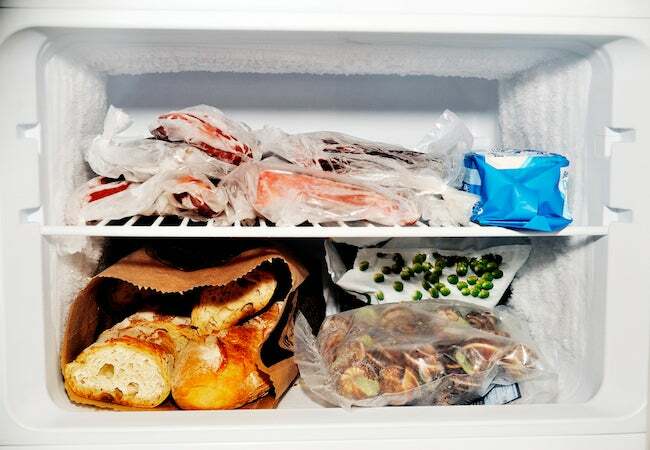 These tricks will help you quickly identify and fix the problem before any food goes to waste. The average freezer lasts 10 to 15 years before you need to replace it. If yours is only a few years old and still not keeping food and drinks frozen solid, though, there may be a less expensive route. Start with some troubleshooting tips before buying a whole new appliance. First, clear shelves and make sure the evaporator fan isn’t covered up by tomorrow’s hamburgers. Overpacked freezers block chilled air from circulating as it should. Make a point of defrosting your freezer every year. If you have a manual-defrost model, check for ice buildup on interior walls. That can drastically cut efficiency. For that matter, so can dirty or faulty door seals. For starters, keep seals clean by wiping them down every few weeks so that no crumbs are hindering their suction. Then, to see if the seals are doing their job, perform the “dollar bill test”: Open the freezer and place one end of a dollar bill against the inner seal, then close the door. If you can easily pull the dollar out, the seals need some attention. If you have to tug to retrieve your dough, the seals are probably fine. Test several sections of each door.